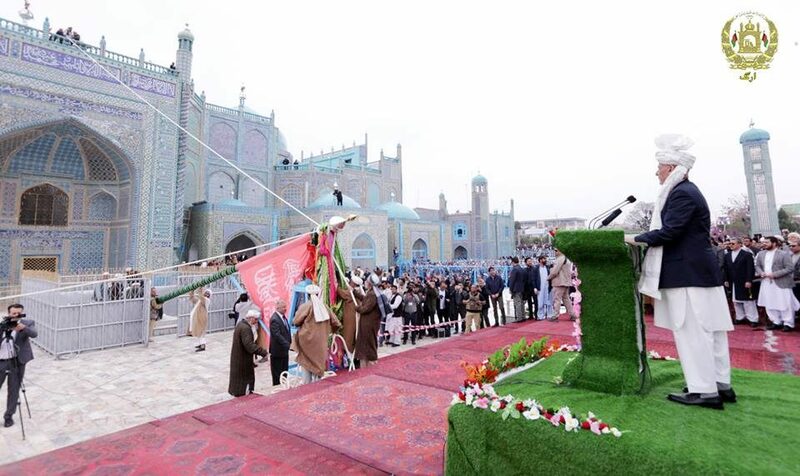 MAZAR-E-SHARIF: President Mohammad Ashraf Ghani participated and addressed a speech in Nawruz and New Year festival held on Thursday in Mazar-e-Sharif, provincial capital of Balkh. In the ceremony held with participation of a number of government high-ranking officials, foreign guests and thousands of residents of Balkh and other provinces of the country, President Ghani by congratulating Nawruz said he hoped New 1398 Year would be a year of peace and stability in the country. “My vision for Balkh is to renovate its greatness and during the New Year, you’ll witness the inauguration of Mazar – Shanghai Corridor,” the country’s President said. Asserting that the government is respecting decisions of the Independent Election Commission (IEC), the country’s President stressed that no delay is acceptable in timeline of presidential elections anymore. President Ghani also by pointing that their goal was self-sufficiency said Afghanistan should provide its ordinary budget in coming four years and should be changed to an exporting country and develop its big resources of water, land and mines. “Allah has granted everything to us – we need unity and plan so that we can maintain tranquility of our people and today’s poverty of the people is not acceptable,” the country’s President said, adding that their goal should be that no Afghans men, women and children should not sleep while they are hungry. President Ghani also said that the New 1398 Year would be a year of peace as peace was important like oxygen to each Afghan, adding that Afghans wanted lasting peace.